I’ve been in a knitting frenzy this weekend and my hands are so sore I’ve got to stop. I got this fabulous Irish wool from Audrey, we wound it into balls and there’s about 2200 yards of the stuff. It’s very heavyweight and I wanted to make an Aran cardigan with it. I’ve looked at patterns, swatched, and finally decided that it is too heavy to make an allover cabled cardigan like I was planning. So, plan B is to make the Circumnavigated Cardigan but add a cable pattern up both sides of the front of the sweater. So, I found a cable pattern in Alice Starmore’s Aran Knitting that I liked. It took a lot of math and swatching to get the right number to cast on considering the pull of the cable. I tried to outthink myself on which side to make the cable crossings. If you know this pattern, you cast on for the body and pockets all at once; eventually you fold the pockets over the body, fuse them at the top by continuing to work up the body and fuse them at the bottom by working the ribbing downward. I worked the cable crossings on the wrong side, hoping that when I folded them over I would now be working them on the right side. 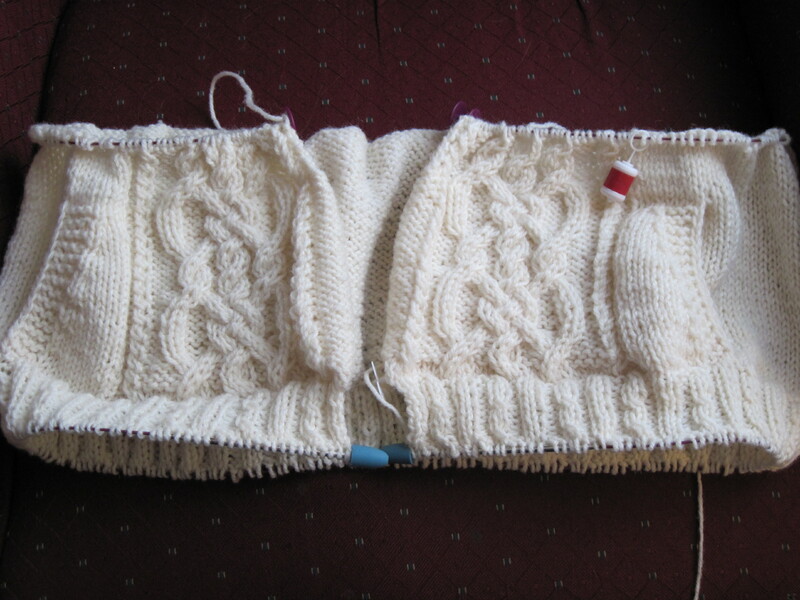 This worked except that one side of the sweater is half a row ahead of the other side; so when working the body I work the right front cables on the front side and the left front cables on the back side. I can’t tell a difference. The yarn is tough on my hands and doesn’t seem to have much give when working the cables, but I’m still very pleased with the progress I’ve made. Just a few more rows of ribbing left, then I’ll go back to the body and it will be quite a bit of mindless knitting for a while. This is probably going to turn out more like a jacket than just a cardigan, but I think I’m going to like it. The pockets are wonderful!